There are a wide variety of different Endobionts in the blood. In fact, from the simplest apathogenic (non-disease forming) PROTIT, they can change forms into pathological (disease causing) species, depending on how much the pH (acidity-alkalinity) of the blood is changed. The higher the acidity, the more pathogenicity, and the more likelihood of developing a chronic, degenerative disease process over time. 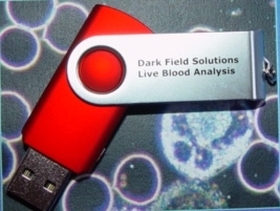 The wonderful world of Live Blood Analysis can enable you to see the different forms in the blood, and to therefore determine how far ahead you are in the disease process. Prof. Enderlein discovered that these Endobionts change into different forms as the internal milieu changes. The more the metamorphosis (different changes), the greater the probability of disease. The pH of our blood is determined by the food we eat, and the nutrients we take in daily, as well as other factors such as stress and pollutants. Fast and refined foods and concentrated protein foods all lead to acidic blood which triggers the Endobiont to change to more pathogenic forms. All microbes partake in a natural developmental cycle, that begins with the PRIMITIVE PHASE which is microscopically invisible; this changes into the BACTERIAL PHASE; and finally culminates in the FUNGAL PHASE, which is the most pathogenic stage. This is the theory of PLEOMORPHISM (many forms), as opposed to monomorphism (one form).